Please see 18th c. Virginian Folk Houses, Part 1, where I describe why I am looking at Henry Glassie's book, Folk Housing in Middle Virginia, 1975, U. of Tennessee. the printing or was it real?" I would really like to have been there as the houses were built. Then I would know. I need Dr. Who's Tardis. So, between now and the loan of the Tardis, I have decided to make some assumptions for this next house. It is the Lesser Dabney house, figure 45, Type 3, House V.Dr. Glassie's book includes a photograph and several other drawings of the house. It was probably built after 1770. The original house included the chimney, but not the shed on the right. I have outlined the house in red. There are 2 overlapping squares -'a-a-a-a' and 'b-b-b-b', or 3 equal rectangles made up of 2 small squares each - 'a-b-b-a'. or half of the large square. This is where I am taking liberties - Dr. Glassie's proportions is not quite as true as I have shown them. The parts do not line up as neatly if I scale on his drawing. But when I make them neat - a couple inches either way, they fit in a simple pattern. I have drawn the diagonals that determine placements with a green dashed line. The determining lines are a green dash and dot line. At the end of the ones I think are where they belong I have added an arrow. Where it doesn't quite work - but so close! almost! - I have added a question mark:'?'. 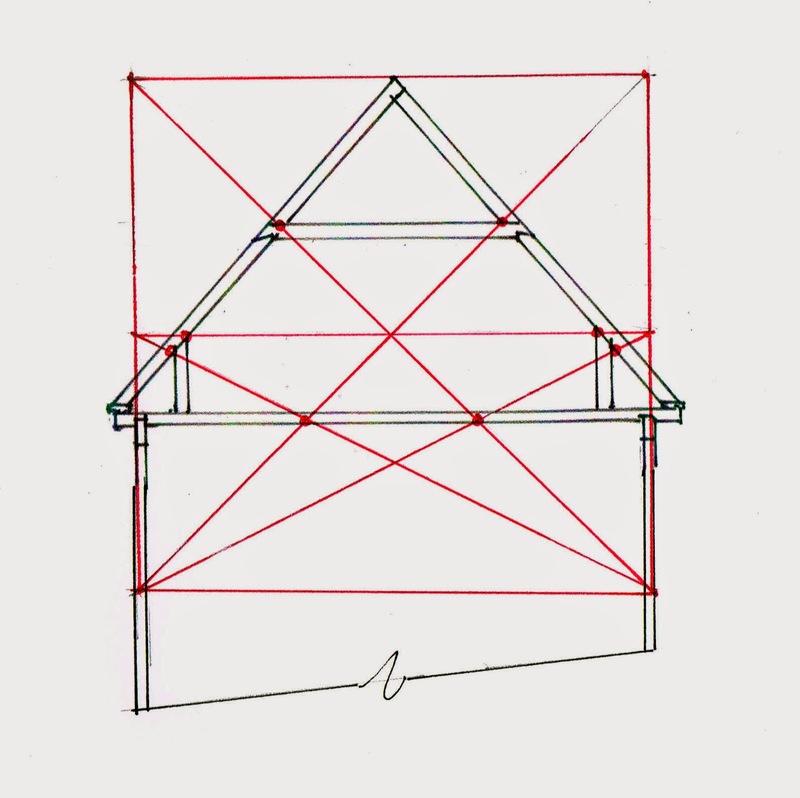 The shed's dimensions are determined by the width, divided in 8 parts, and the length, the extension made from 3 of those parts. This results in 2 3-4-5 triangles and assures a square fit of the wing to the house. Figure 69, The Loft, a section through the frame of house V.
Dr. Glassie included the interior wall finish (I think). I have left out that line. Thinking about how the roof would have been framed to sit on the walls below, I extended the line of the posts as high as the peak. Then I crossed the diagonals to make the square, and crossed the collar ties at their juncture with the rafters. The center-line of the square crosses at the top of the knee walls. 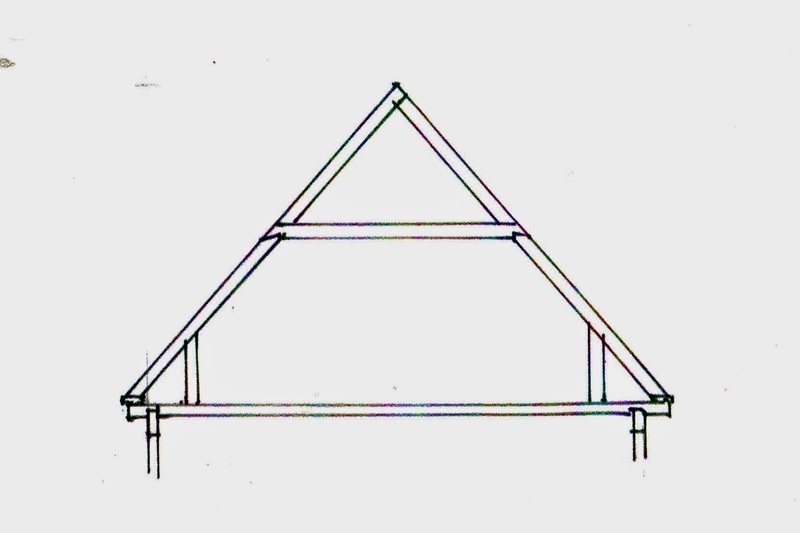 the diagonals of the half square cross the diagonals of the full square at the ceiling joists. I am sure there were other considerations: reinforcing the eaves where they kick out, and tying together the rafters at a point where they will adequately hold the frame, but leave enough head room to make the attic useful. Both of these two houses are they were printed in Glassie's book, Folk Housing in Middle Virginia. I didn't adapt anything. The geometry was obvious and easy. This is Figure 39, The Central Hall I House, West of the Blue Ridge. A. It is in the Valley of Virginia. The right side, through the entry hall, is built with logs. The left side added later. 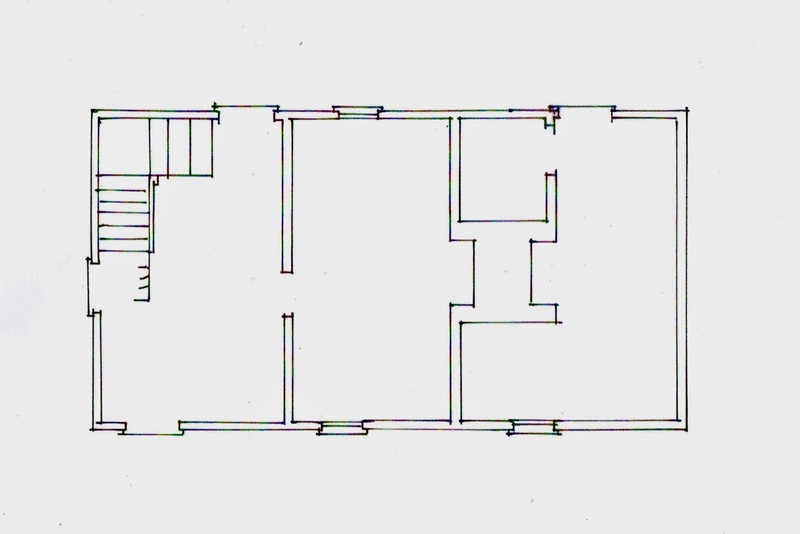 The pattern of the original house is familiar: the square - red solid lines - and its half squares - red dashed lines - with the intersections of the diagonals marking window openings, chimney width, placement of the wall between kitchen and entry hall, and the 1/4 width added to the square to give the entry hall enough space for a turning stair- green dash and dot lines. Then the left wing was added. Its dimensions are the 3-4-5 triangle - black dashed lines - with the existing wall designated as '4'. Its center-line locates the windows - green dash and dot lines again. The windows on the front wall are not quite equi-distant from the corners, but close enough to read as balanced. Finally, Figure 39, The Central Hall I House, West of the Blue Ridge, B. A house in Falmouth, Pendleton County, Kentucky. 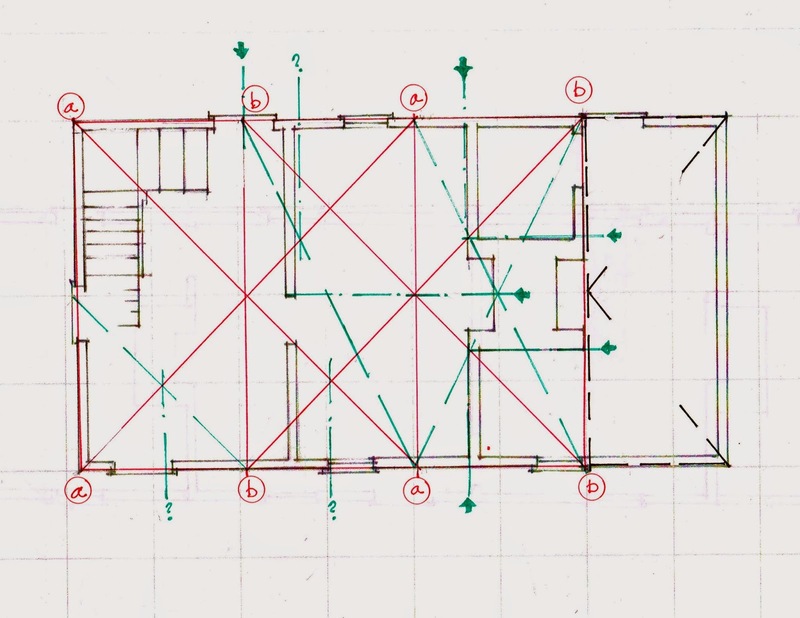 Both rooms are square - red lines, their windows, doors, and fireplaces are on axis - green dash and dotted lines. 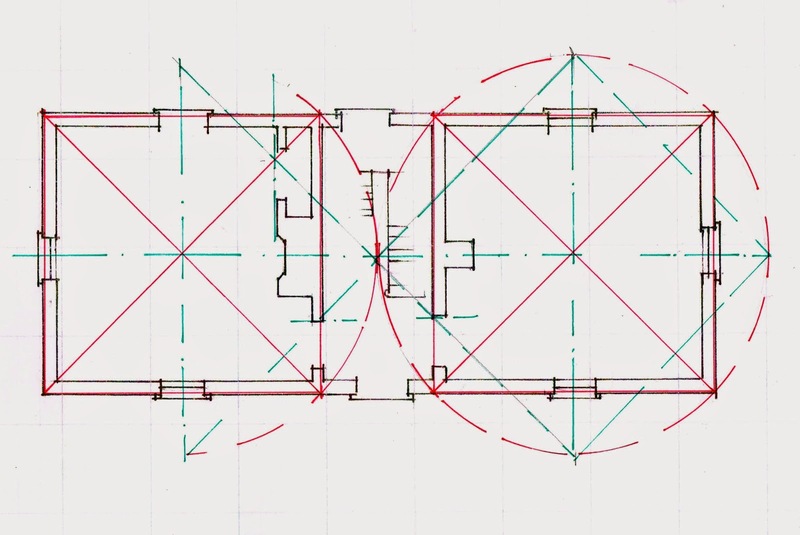 The circle around the square - red dashed line - determines the width of the hall, the relationship between the 2 rooms. It could also be found by turning the square 45*. 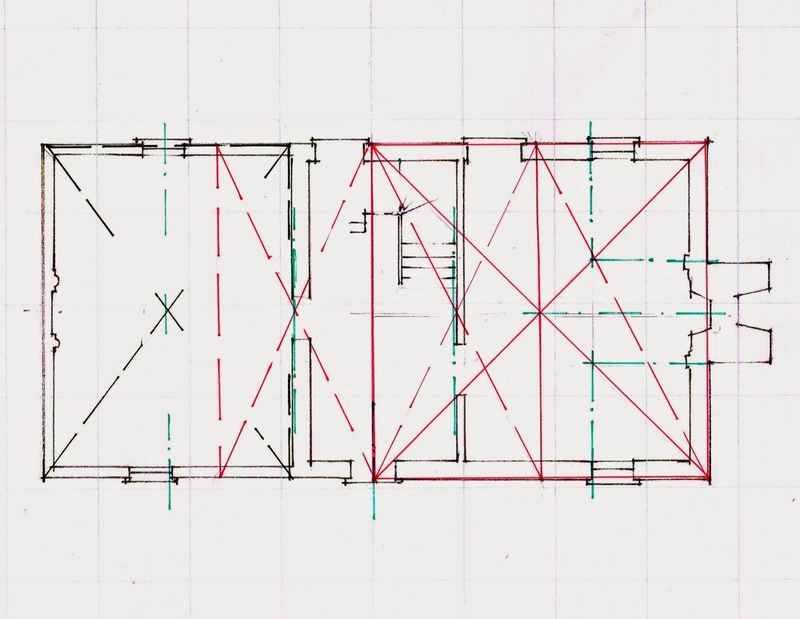 Those intersections also place the doors into the hall and the fireplace and closet in the left hand room - green dashed lines for the turned square. This house, if its chimney in the right hand room for a cast iron stove was built with the house, may date to the 1830's.